S ½ of the NE ¼ and the E ½ of the SE ¼ of Section 28, Township 13, Range 9 E.
Calculated from the legal description the property totalled 160 acres–in theory. I decided to search the homestead applications for Nebraska that are in the database of these completed claims at Ancestry.com. 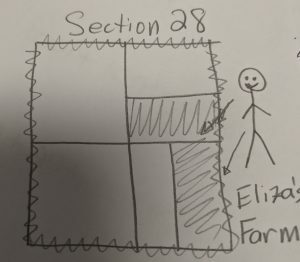 That file should tell me when Eliza filed her claim, some details about the farm operation, who the witnesses were, etc. Significant family details would not be included, but if Eliza’s claim was typical she would indicate that she was head of a family, a US citizen (which I knew), and perhaps how many individuals were living in her family. Other details, if there were any, would be an added bonus. It took me a little while to find her claim. It was not indexed under Eliza Ramsey. It was not geographically tagged as being in Section 28 of Township 13, Range 9 East. I tried searching under her husband’s name–in case it was filed when he was alive. I tried searching the entire township thinking the section number was wrong. Experimentation continued and I was just about to stop and set up a chart to track all my search variations as I felt that I was going in circles and overlooking search combinations. Then I found it by accidentally dropping of the north/south direction on the range and left it blank. Indexed under Eliza Rhamsey in section 28, township 13, range 9 west. I should have used the Soundex option originally, but I didn’t. The difficulties were not all Ancestry.com‘s fault. The name was Rhamsey throughout the file. There were even a few instances where the “h” was inserted above the Ramsey when a clerk originally wrote it that way. Those references lead me to believe that it was spelled incorrectly in the original paperwork and, to make it easier, that spelling was used throughout. 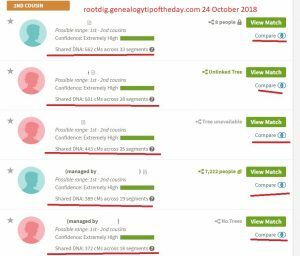 The directional error–that was Ancestry.com‘s fault. It’s clearly township 9 east and is written as 9 east throughout the application Land records officials may occasionally spell a name incorrectly, but they know (or they should) that correct legal descriptions in documents are extremely important. Ancestry.com is going to make the occasional error. These errors get noticed when they cause “issues” for the researcher. All the other times go unnoticed because the researcher finds the record and goes right on their genealogical way. Being able to problem solve and trouble shoot when something cannot be found in an index is a good skill to have. Charting out search options is another good practice as well. Not for every search, but for those where the person can’t be easily located it is a good research tool. Being able to search these records geographically is an excellent way to locate additional files and records. We just have to keep in mind that any tool has potential limitations. There’s more in Eliza’s homestead file, but we’ll save that for a future post.